This item is very clean and has been examined thoroughly. Includes: Complete figurine with shoulder and waist articulation. Size: 3". Condition: Excellent quality with tight joints. 9/10 100% guaranteed to be received as listed. Other M Samus Aran. Zero Suit Ver. THAT DON'T PASS. The amount depends on the declaration price. because R-SAL takes long duration(on average 4-5 weeks). 100% AUTHENTIC. We will try to resolve any issues. WORLD OF NINTENDO CHECK IT OUT! WORLD OF NINTENDO. HARD TO FIND ! BOX MAY HAVE SIGNS. (SPECIAL PRICE). SPECIAL PRICE ! The object for sale is ONE item (unless otherwise indicated). This item is very clean and has been examined thoroughly. Includes: Figure only as shown. Size: 4.25" actual. Condition: Excellent quality with tight joints. 9/10 100% guaranteed to be received as listed. WORLD OF NINTENDO METROID SET SAMUS ARAN & 2 METROID BRAIN 2018 JAKKS PACIFIC. Condition is New. Shipped with USPS Priority Mail. Condition is New. It was released by JoyRide Studios through NintendoPower in January 2003. 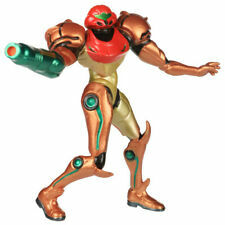 World Of Nintendo Metroid Samus Exclusive 4" Action Figure [Metallic Paint] Toy. Condition is New. Shipped with USPS Priority Mail. MISSION COMPLETE! Using the smooth yet poseable joints of figma, you can act out a variety of different scenes. A flexible plastic is used which allows proportions to be kept without compromising posability. Hi, you are looking at a MIB world of nintendo samus 4.5 inch action figure with mystery accessory which comes from a pet and smoke free home. Please refer to photos for details. Thank you and happy buying!!! From MAX Factory. Portal gun is included as an accessory for P-Body to hold. Includes articulated figma stand. ● ensure the range of motion without distorting the proportions by using a soft material in the key point. Middle East. Your country is very far from Japan and it takes long till the item reaches you. So get the item before it's gone. LIGHT SUIT. Light Up Suit Feature. Exclusive Edition 162/1000. Release Date:December 2015. "World of Nintendo" brings many of it classic characters to the 4" format. Very hard to find. Trending at C $35.52eBay determines this price through a machine-learned model of the product's sale prices within the last 90 days. “Hello beautiful people of Ebay” Up for sale now is World of Nintendo Phazon Suit Samus 2.5” Figure brand new sealed! This is a Walgreens Exclusive so don’t miss the chance to grab it before is gone!! Please don’t hesitate to contact me if you have any question related to this item, and If there is any type of issues with the item after receiving it please,please,please contact me before deciding to leave any undesired feedback that I will gladly work with you to resolve the issue!!! May God bless us all!!! FIGMA SAMUS ARAN. MAX FACTORY. Manufacture by Max Factory. Brand New Sealed. Box has Light Wear. Check out Pictures for more detailed description of item Condition -US Seller - Fast Shipping -Note: If by some chance you experience an issue with your purchase, please contact us immediately so that we can provide a prompt solution before leaving negative feedback; We value your business. -Check Out Our Store. New Items Listed Weekly! 4.5" SAMUS ARAN figure METROID series WORLD OF NINTENDO 1-2 pacific JAKKS 2016. Condition is New. Shipped with USPS First Class Package. Trending at C $28.29eBay determines this price through a machine-learned model of the product's sale prices within the last 90 days. Using the smooth yet poseable joints of figma, you can act out a variety of different scenes. A variety of interchangeable hand parts including the "Samus thumbs up" are included. An articulated figma stand is also included. I tem sold as is. Model : 133. Condition : New. Metroid Other M 6 Inch Action Figure Figma Series - Samus Aran Zero Suit. Nintendo Samus Amiibo from the Super Smash Brothers series. As you can see from the picture, there is a small crease in the left corner of the box. Clad in the Zero Suit she wears on missions. A Japanese import by Max Factory. All my products are 100% Authentic ! From Max Factory. Using the smooth yet poseable joints of figma, you can act out a variety of different scenes. A flexible plastIC is used for important areas, allowing proportions to be kept without compromising pose ability. 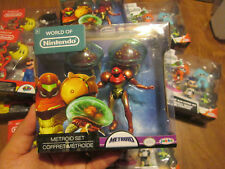 Up for auction is Jacks Pacific World of Nintendo series 1-2 Metroid Samus action figure new in sealed package. The pictures shown is of the same product you will receive. The main character with her power suit removed — Samus Aran: Zero Suit version. The smooth yet poseable joints of figma allow for a variety of different scenes. A flexible plastIc is used for important areas, allowing proportions to be kept without compromising pose ability. Says appeared in the figma! -Smooth and poseable figma original joints in the scenes in the movie. -Various scenes can be poseable figma stand is included. And distorting the proportions used at key points in the motion. Non-scale ABS & PVC painted acti. Published photograph of you may be slightly different from the actual product. Condition New. We accept only unopened item. We do our best for you!! expedited worldwide EMS about 1 week yes. (take 2-4 weeks). I live in Akihabara. Interchangeable Head. Display Stand. Set contents Interchangeable Hand left / right. (take 1-2 weeks). Product Features . The key point to be using a soft material ensure the range of motion without destroying the proportions in. • In addition to the visor of the mask, it adopted the clear parts in detail there, such as the back of the hand and hip-knee that emits light in the play. It appeared in figma! ・ Included figma exclusive pedestal with movable struts enabling various scenes. - By using soft material in important places, not proportion is maintained and secured range of motion.